As you know I belong to a support group for younger people diagnosed with cancer. 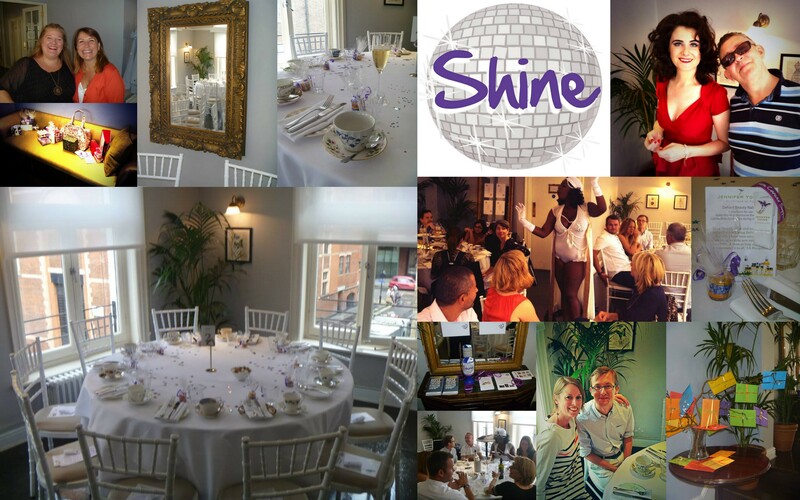 Shine Cancer Support was set up by cancer patients who realised they didn’t quite fit into the ‘norm’. The organisation has groups through England (more all the time) who meet up regularly. The London group meets every month, usually in a pub or a bar. We talk about our experiences sometimes, we share what we have learnt and sometimes we don’t mention cancer at all but simply talk about getting on with life. It’s not like many groups where you may sit around a circle and discuss problems. More like a group of friends with a common interest. Today was a fundraising afternoon tea in order to raise funds to keep the group going. We don’t have huge costs but the charity likes to pay for the first drink so that anyone affected by cancer in their 20s, 30s or 40s can pop along for a drink with some new friends. Great afternoon. A few introductory stories from Ceinwen and Richard. Fun entertainment. Always fun to catch up with my Shine friends. Hopefully raised lots of money too… if we have more than enough for the London group, the excess will go toward other groups being set up or a retreat that is hoped to happen next year. This entry was posted in Support, Volunteering and tagged Volunteering by AnnaGoAnna. Bookmark the permalink.